Rushed mornings with no time to spare before getting the kids and yourself out the door is a common problem. Breakfast is a must but waiting for your bread to get toasted should be a thing of the past if you do more than two slices at a time. Our picks for the best 4 slice toasters cover both high end models as well as budget ones, but all of them do a great job at toasting fast and consistently. So, what is the best 4 slice toaster to buy for your family? The first criteria is that it should do its job reasonably quickly and each slice of toast should have a nice and even browning on both sides. The amount of toasting should be easily controlled with at least 5 browning levels. An important feature to look for is whether it has a crumb tray and whether the unit as a whole is easy to clean. You don’t want to have to dig inside to remove crumbs. Because there are more slots available on a four slice toaster, a nice feature would be independent toasting controls, so that two people can each get two slices toasted exactly to his liking. If you freeze bread or like to toast your bagels on just one side, a special setting for each can be very helpful so that you don’t have to constantly check progress and then turn slices around to do the other side. A 4 slice long slot toaster is helpful for artisan bread types that come in wide oval shapes. We do also have a list of top picks for long slot toasters. Our best 4 slice toaster reviews below pick just 6 of the best for a range of budgets. The Breville BTA840XL is definitely one of the most preferred high end 4 slice toasters. This toaster features 1800 watts of power as well as convenient functions, such as auto lowering with just a touch of the button. The internal smart chip monitors toasting, so you get it right every time. The “bit more” setting lowers your bread to give it just a touch more toasting time if you decide that you want it just a little darker, and the automatic lift and look function lets you take a peek at your bread and return it to toasting without cancelling or interrupting the cycle. 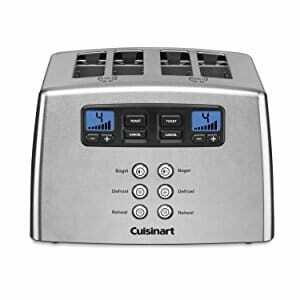 This best rated 4 slice toaster also includes a defrost function and can easily accommodate bagels and thicker slices of bread. The LED panel lets you monitor the progress of your toast, and with independent left and right side controls, you’ll even be able to customize each side to give you two different levels of browning. This is a great feature when you’re making toast for more than one person, and each of you have your own preferred level of browning. The Breville BTA840XL even gives you an audible beep to let you know when your toast is done. This 4 piece toaster offers incredibly even browning with advanced features that make getting perfect toast as simple as possible. However, a few customers say that it doesn’t brown both sides evenly. This is a concern that you can test and return it immediately if you want to try it anyway. The exterior is made of brushed die-cast metal that is easy to wipe clean and provides a nice retro look for your kitchen. This Breville 4 slice toaster is at the high end for price, but it is also one of the best toasters you’ll find on the market. The Cuisinart CPT-440 Touch to Toast is another excellent high end toaster, but is available at a significantly lower price than the Breville. Of course, this also means that it doesn’t have the same number of features, but it still offers the best 4 slice toaster for the money. This leverless toaster by Cuisinart features intuitive digital technology that makes it easy for anyone to use. It comes with multiple toasting functions, including bagel, defrost, and reheat options. The defrost function lets you first defrost your bread before toasting, and the bagel setting provides toasting only to the upper half for a perfectly toasted bagel. Of course, if you want your bagel toasted on both sides, you can simply skip the bagel selection and the wide 1-1/2” toaster slots in the Cuisinart will hold your bagel while toasting it like a regular piece of bread. You just place your bread in the slots and press the button for whichever function you want after you set the desired toast level. The bread goes down and pops up when it’s done. This Cuisinart 4 slice toaster offers dual independent toasting cycles, so you can make toast with two different toasting levels at the same time. Whether you want to toast bread and bagels at the same time, or you’re making toast for two people who each like a different level of toasting, this dual setting is definitely a great feature. The Cuisinart Touch to Toast comes with a handy countdown feature as well as an LED backlit display, motorized lift, and toast ready beep. The sleek stainless steel exterior offers a state of the art design, so it will look nice in any kitchen, and the convenient cord wrap is a great way to keep counters clear, although some users find the cord a bit short. It comes with two crumb trays that you remove from the back. The KRUPS KH734D Breakfast Set 4-Slot Toaster has some common features from the two above but at a much lower price. Two sets of levers and controls regulate the two sets of toast slots and you get 6 levels of browning. Choose between Cancel, Toasting, Defrost, Reheat and Bagel functions that light up with LED lights, and when the toasting is done, use the high lift lever to lift smaller pieces high up for easy removal. The slots are large and long enough for bagels, buns and thick slices of rustic or artisan bread, making this the best 4 slot toaster for all cuts of bread. However, a few customers say that this toaster is quite slow. There are two independent crumb trays that slide right out for emptying. The brushed and chrome design makes this a good pick for a modern kitchen. Whether you’re toasting bread, bagels, English muffins or waffles, you’ll get the perfect level of toasting every time with the Hamilton Beach 4 Slice Cool Touch toaster. This toaster features wide 1-1/2” toasting slots making it easy to toast thick slices of bread, such as artisan or homemade bread as well as frozen waffles, and English muffins. If you like bagels, you’ll enjoy the bagel function on this sleek and practical Hamilton Beach toaster. It ensures your bagels come out perfectly toasted on top, with a tender, chewy center. Independent controls on each side let you individualize your toasting to meet a variety of needs. Each side has controls for frozen toast, frozen bagel, bagel, and cancel. You can also dial your preferred level of toasting from 1 to 5, so you get your toast the perfect color every time. The Hamilton Beach 4 Slice Toaster comes with an automatic toast boost to lift your food higher, so you can easily remove it without having to dig it out with a fork or knife. When you want consistent performance and even browning, time after time, this Hamilton Beach 4 slice toaster will give you toast, just the way you like it. It will uniformly warm and toast bagels, English muffins, bread and waffles, even if they are frozen. The stylish cool touch black exterior makes cleaning easy and it can easily coordinate with just about any kitchen decor. It also comes with two slide out crumb trays for added convenience when cleaning. The Oster TSSTTRWF4S brushed stainless steel 4 slice toaster features 7 toast shade settings, so you can choose your preferred level of toasting from light to dark. The advanced toasting technology of this Oster toaster includes dual auto-adjusting bread guides that automatically adjust to accommodate a variety of bread thicknesses, ensuring that every slice of bread is evenly toasted, regardless of whether it’s regular or thick sliced. The extra wide toasting slots in this toaster are designed to accommodate everything from bread and bagels to waffles and English muffins. There are even settings for frozen, reheat, bagel and cancel, so even if you are toasting a frozen waffle or frozen pastry, it will come out perfectly toasted every time. The frozen setting gently warms the food, then once it’s defrosted, it toasts it to your preferred setting. If you want your bread toasted to about a medium level, setting the toast shade selector between 4 and 5 is ideal. This level of toasting will take approximately 2-1/2 to 2-3/4 minutes and you’ll get even toasting that is just right. The Oster 4 slice toaster even includes two handy toast lifts that will elevate smaller pieces of food, making them easy to remove, even when hot. The sleek brushed stainless steel finish ensures easy cleaning and a great look for any kitchen. Additionally, the dishwasher safe, removable crumb tray makes it quick and easy to remove crumbs after toasting. This Oster toaster also features a retractable cord that is designed to help keep kitchen counters clutter-free. The Hamilton Beach 24444 Smart Toast toaster with extra wide slots is designed to accommodate regular sliced bread as well as thick cut bread, pastries and bagels. Regardless of the thickness, you’ll always get even toasting, even with homemade bread. This Hamilton Beach toaster features three functions, including toast and bagel functions as well as a handy defrost button. If you want to toast frozen waffles, the Hamilton Beach 24444 will thaw, then toast your waffles to perfection. When it comes to smart features, the Hamilton Beach Smart Toast toaster is designed for easy use. The shade selector lets you choose exactly how you like your toast, and the toast boost feature ensures you’ll be able to remove even the smallest pieces of toast with ease. The Hamilton Beach also includes a number of important safety features, such as an automatic shut-off if your toast happens to get stuck as well as cool touch sides to prevent burns. The removable crumb tray makes clean up easy, and the sleek design makes it an attractive toaster that will look great on any kitchen counter.